The referee's whistle is blown and the excitement begins! The shooter begins randomly pulling on levers, pneumatically firing the safe foam balls at the goal. Don't let this cute, unassuming appearance fool you; this game is a real killer if you're not lightning fast. This game can be themed many different ways by changing the backdrops and objects. Ride'em Cowboy! 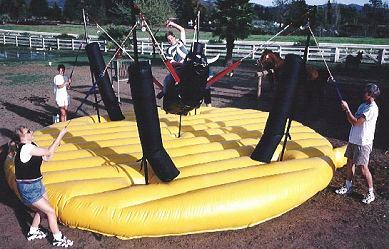 Remember the mechanical bull craze, Urban Cowboy, John Travolta and all the hubbub? The mechanical bull disappeared due to the number of Chiropractors it kept in business Well it's back, it's safe and it's interactive. Yeeeehah! 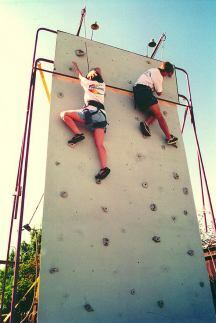 Using custom rock forms, this wall has a number of routes and is therefore fun for all levels of climbers. Our newest invention, Strata Ball adds a whimsical appearance to any event. 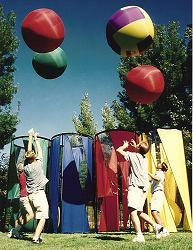 The game is played with 4 - 10' tall cylinders colored red, blue, green and yellow. Four - 4' diameter super bouncy balls (one of each color) are distributed to the teams. You have never seen anything like it! 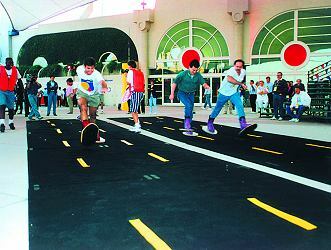 Two competitors line up on the starting line of dual 40' long runways; complete with highway lines and road signs. The game is both competitive and hilarious. 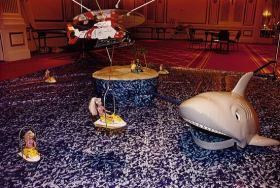 Frolicking jet skiers cavort and play in shark infested waters and your team is charged with rescuing the intellectually challenged Barbies with a helicopter before they're gobbled whole by a famished Great White. 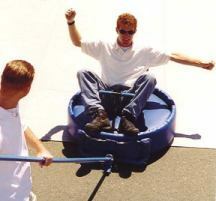 Shuffle riders hop into their disks and are ready to be propelled down the board by players using custom shuffle pushers. 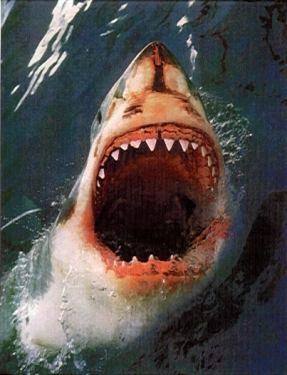 Remember Jaws, the movie? Remember how you had second thoughts about going for a swim in the ocean? Well you may just feel that way again after playing with the latest contraption from Toyworks. The game is very kinetic and fun for all ages.